In an interesting study from 1991, Gillespie et al studied ten patients consistent with the symptoms of interstitial cystitis. All of them had also suffered from lower back pain, although this had been overshadowed by the pain caused by their interstitial cystitis. Upon further examination, all patients had a spinal compression of the nerve connecting the bladder to the brain. Decompression of the nerve led to immediate relief of bladder pain in 9 out of 10 patients . The bladder is connected through nerves to the brain via the spine. Through these nerves, the bladder sends signals to the brain telling it that it is full and needs to empty. When we decide to go to the toilet, the brain sends signals back to the pelvic floor muscles telling them to relax. When the process of urination begins, the external sphincter of the bladder opening (urethra) relaxes and the bladder muscle contracts. The reverse happens at the end of urination. A large group of nerves to the bladder originates from between two vertebrae in the lower spine (called the lumbar fourth and fifth interspace). The nerves exit the inside of the spine through a space in the backbone (the entrance zone), underneath the bony bridge (the pars articularis) and then out of the skeleton through the facet joint. Most nerves have both a motor and a sensory branch in the same tube. The motor nerves control muscle contraction and the sensory nerves control blood flow, pressure and pain. As we’ve learned, many of the nerves to the bladder originate between the lumbar fourth and fifth interspace. A compression of the disk in this area can hinder messages to the bladder from being transmitted. The neurotransmitter responsible for transmitting messages over the bladder nerves is called acetylcholine. If the transmission of acetylcholine is cut short by spinal compression, the nerves may not build up enough ‘current’ for the bladder to contract efficiently. This could lead to the bladder not emptying properly, leaving residual urine. This would be ideal breeding ground for infectious bacteria. Cystitis can be the end result. As we’ve seen above, both motor and sensory nerves exit the spine through three points. Each of these three points can be prone to injury. If there is damage to the spine at any of these points, the nerves can be compressed. For the nerves to function optimally, they need to be connected to the ‘mother cells’ in the spine or to the central nervous system and they must have a continuous oxygen supply. Any compression or damage to the nerve can cause it to lose these connections and it may start to function abnormally. The end result could be a wide spectrum of changes to the bladder – as seen in interstitial cystitis. As shown in Gillespie et al’s study, this seems to be the case especially when the fifth lumbar nerve is compressed. Unfortunately there has been a lack of more studies into the bladder-back connection. Two chiropractic papers have looked into the connection between the spine and interstitial cystitis and have found that manipulation of the spine alleviated interstitial cystitis symptoms in most cases [3, 4]. Up to 90% of adults in the US alone are expected to have lower back problems at some point in their life. Because it is such a common problem, the bladder-back connection should not be ruled out. 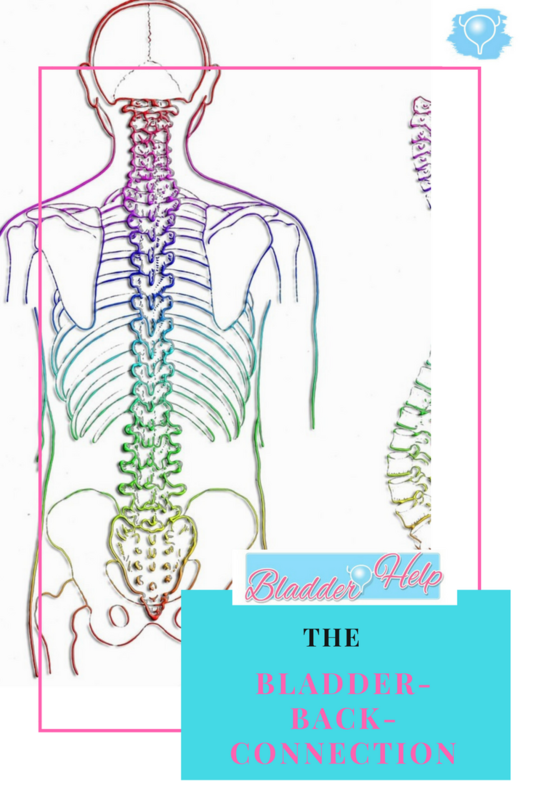 Stay tuned for PART 2 in which I’ll look at causes and solutions for bladder issues related to back problems. Now I’d like to hear from you: are you suffering from back problems on top of cystitis? Has anything helped you? Let me know in the comments!